Two 2gb sticks for 4gb total. Frequency: PC2 6400S DDR2 800MHz. 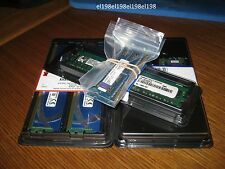 2GB PC2 6400S DDR2 800MHz 2RX8 200PIN SO-DIMM Laptop RAM x 4 pieces. Before you order, make sure the RAM is compatible with your motherboard/CPU. Speed: PC2-5300 667MHz. Total RAM = 4GB RAM. 2nd and 3rd Picture simply showing we have a LOT of these. PICTURES:1st Picture of Actual Item. Picture is of an Actual Item. Any item marked “AS IS” for any reason. Number of Pins 200PIN. Bus Speed 800MHZ. Type DDR2 SDRAM. MPN KTH-ZD8000B/2GB. DDR2 SDRAM. RAM Modules are NEW and have not been used. Number of Modules. It's made to last and it's truly the largest difference between the stuff you "can get" and the stuff you must have to change the way you compute. DVD OR BLU RAY New (Other See Details) The product was extracted from a NEW ITEM. GRADE A The product is in good condition and shows a minimun of use. GRADE B The product is in regular condition and shows moderate wear. Pulled from personal HP laptop as my screen cracks. 2GB each, total of 4GB. Item is new and in excellent condition. 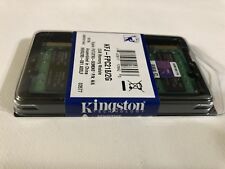 Kingston Laptop RAM. Used, Like New, Not Tested. Conditions: excellent. Above include. the following conditions. SKU: DA2-11845-CB. Hours of Operation. Totaling 20GB . Conditions: excellent. Part number the following conditions. You have understood & agreed the. Feature: DDR2 PC2-6400. Why choose Kingston?. Part Number: KTA-MB800/2G. •Expertise: Kingston is involved in the DRAM process from the dicing of the wafer to encasing the integrated circuits to assembling the module to testing the finished product. Genuine Kingston DDR2 800 MHz SDRAM. Capacity: 2GB (1x 2GB). Type: DDR2 SDRAM. 1X 2GB RAM MODULE AS DESCRIBED (KINGSTON). KINGSTON ACR256X64D2S800C6 2GB 200p PC2-6400 CL6 16c 128x8 DDR2-800 2Rx8 1.8V SODIMM NOB. If you would like to upgrade the class of service, a variety of options are also available. Only materials that "as good as new" are used. We will do our best to resolve the problem! Our friendly professional team will try to get back to you as soon as possible! Frequency: PC2 6400S DDR2 800MHz. 2GB PC2 6400S DDR2 800MHz 2RX8 200PIN SO-DIMM Laptop RAM x 1 piece. Before you order, make sure the RAM is compatible with your motherboard/CPU. We are committed to resolve all issues in a friendly and satisfactory manner. 200-Pin DDR2 SO-DIMM. DDR2 667 (PC2 5300). This module is manufactured for use in Apple Computers. iMac, Mac mini and MacBook.